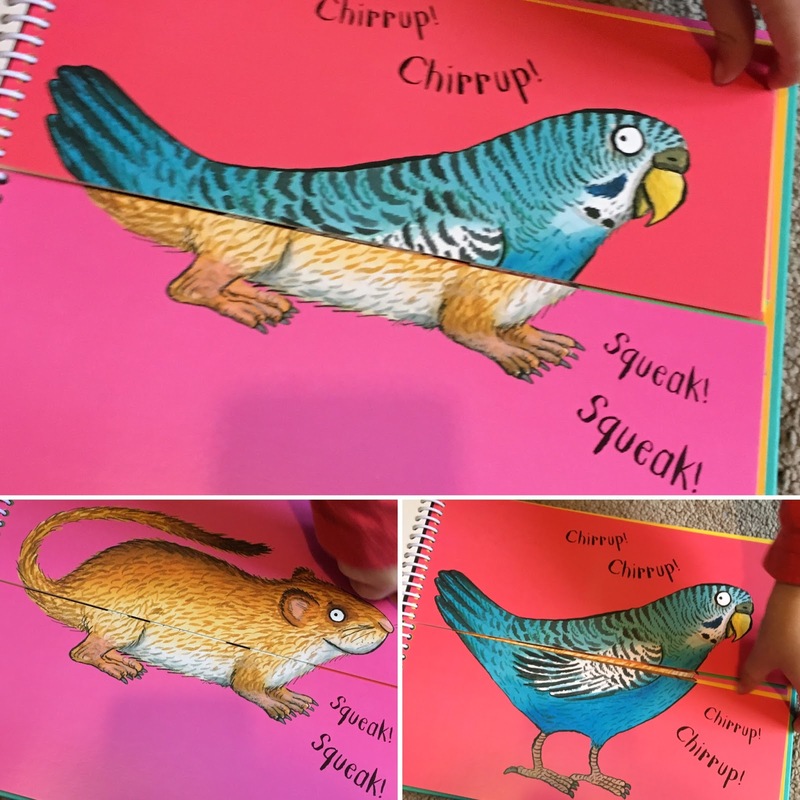 We recently received a copy of "Axel Scheffler’s Flip Flap Pets" to review. 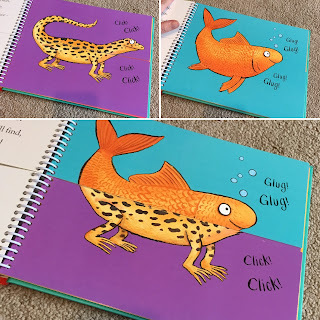 Published by Nosy Crow, this is a new book for children ages 2-5. It is no secret that, as a family, we love Axel Scheffler’s illustrations (especially Pip and Posy) but when I first saw this new book online I confess I was a little underwhelmed. I thought it just looked a bit gimmicky. However, now having had the pleasure of exploring it with the Mini Reviewers, I am delighted to say my first impressions were entirely wrong! 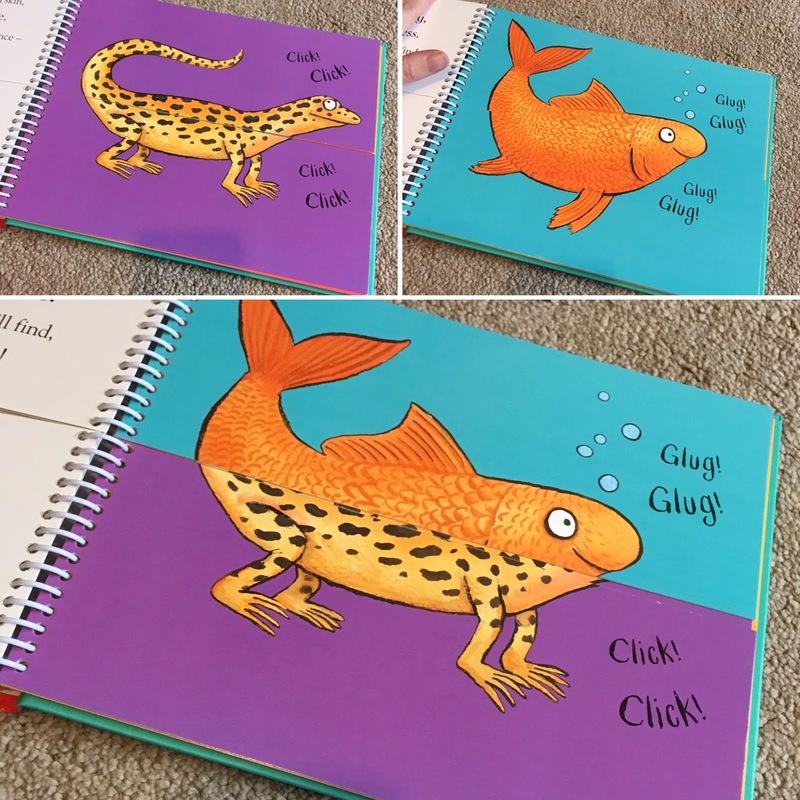 Flip Flap Pets is a fantastic interactive book for little ones. It is tough and spiral bound so will withstand being pulled around by sticky little hands. It has simple rhyming text and animal pictures that you can mix up to create new crazy new creatures. Have you heard of a Goldfard? How about a Budgerbil? No? Well neither had we until we read this book. There are apparently 121 possible animal combinations. We haven’t kept count ourselves but we have tried them all. There is certainly plenty in this book to ignite imaginations and keep little (and not so little) ones occupied for a very long time. The crazy creature combinations, bizarre names and funny rhymes have caused a lot of giggles in this house. We would definitely recommend it. 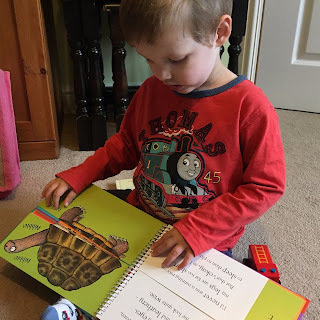 Flip Flap Pets has become a particular favourite of Theo (2) who is fascinated by the different animals he can make. There is also Flip Flap Farm, Flip Flap Jungle and Flip Flap Safari in this series. So if Theo's a good boy, perhaps Santa will bring him a few more! Disclaimer: We were sent a copy of this book to review through Toppsta, however, all opinions are as always our own. We love Flip Flap Jungle and even though my daughter is now too old for these books they still do occasionally accompany us home from the library! This looks fab, I'll have to keep a look out for it. We've got Flip Flap Safari and my girls love it. Oh this is a great idea for a book. I love the idea of Goldfard's and Budgerbil's. This looks like so much fun! Love Axel Scheffler's illustrations!